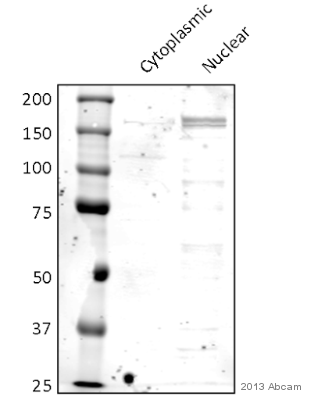 Synthetic peptide corresponding to a region between residue 50 and 100 of human Nup153 (NP_005115.2). 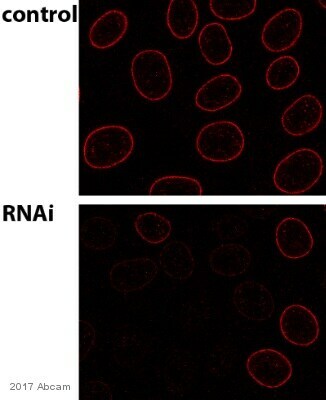 Purified using an epitope specific to NUP153 immobilized on solid support. 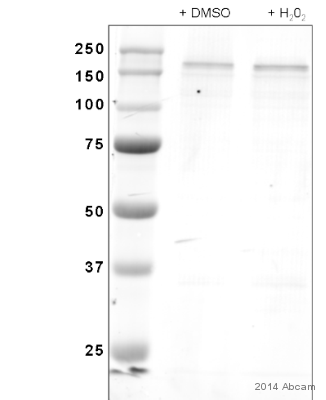 Antibody concentration was determined by extinction coefficient: absorbance at 280 nm of 1.4 equals 1.0 mg of IgG. Our Abpromise guarantee covers the use of ab84872 in the following tested applications. ICC/IF 1/100 - 1/500. (formaldehyde fixed cells). Permeabilization with Triton X 100 is recommended. Acetone fixation is not recommended. 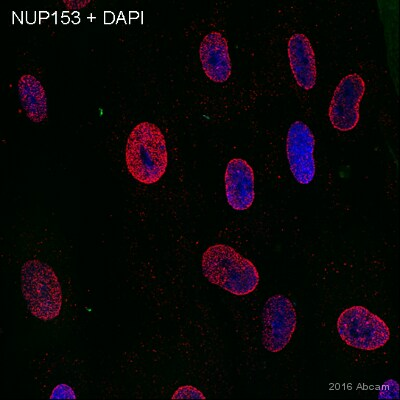 Staining of human NUP153 in NBF fixed, asynchronous HeLa cells by Immunocytochemistry, using ab84872 at a dilution of 1/250. Detection: Red fluorescent goat anti-rabbit IgG used at a dilution of 1/100. 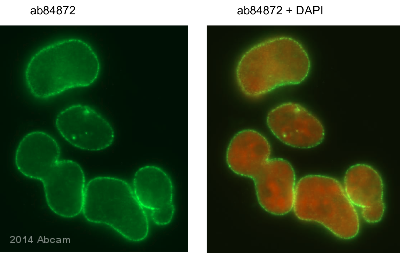 Staining of human NUP153 in NBF fixed asynchronous HeLa cells by Immunocytochemistry, using ab84872 at a dilution of 1/250. 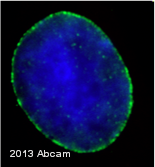 Detection: Red-fluorescent goat anti-rabbit IgG used at a dilution of 1/100.